A suspected criminal, Mr. Ugochukwu Okeke, who strips himself before going for operations at night has been apprehended by the police in Lagos. 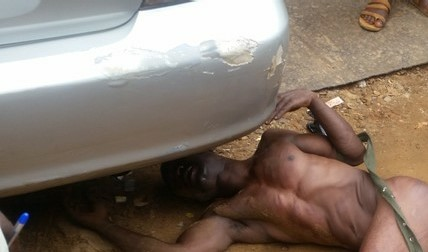 The suspect was apprehended Unclad by the residents of Oke Afa in Isolo, Lagos, after he attempted to break into a company known as Pat-Rax Sanitary Wares at night to steal. The company was located at Bestford Street in Oke Afa Isolo, Lagos.